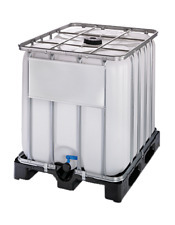 1000 Litre IBC Tank (COLLECTION ONLY). Condition is Used. Washed out and clean, some stsining may be evident. 1000 Litre IBC Container | Storage Tank | Plastic Pallet | Clean | Black. Condition is Used. Collection in person only. This is an IBC adapter with brass bib tap and Snap-On Tap connector. These fittings are Hoselock compatible. 1 x IBC Tank Cap. Once we know you have not received your item we will investigate the matter fully both internally and with our carriers. Our IBC adaptors & IBC tank fittings are purposely designed to ensure ease of use and a safe and secure operation for the off-loading of IBC tanks. You are buying a Ibc water tank hose pipe fitting. Used for the transport of water based printing solvents / inks / chemicals, traces of which will remain in the IBC and can be washed out with a hose / jet wash. The inks occasionally stain the tank slightly but do not leave a physical residue. IBC 1000L Containers/ Storage Tanks. These have previously been filled with vegetable oil and are supplied as seen i.e. not washed out. Price is per single container. Collection only, just outside of Bicester, Oxfordshire. Used IBC, 1000L. Has been used for storing water based substance. IBC 1000L container / storage tank. Condition is Used for chemicals but not harmful. Once cleaned with soapy water you can store whatever you want in them. All with caps and working taps. 20 Nr in stock. Our IBC adaptors & IBC tank fittings are purposely designed to ensure ease of use and a safe and secure operation for the off-loading of IBC tanks. 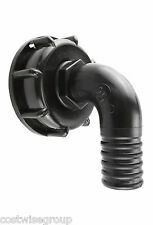 Connects to your ibc hose. (Photo of the ibc would help). Our IBC adaptors & IBC tank fittings are purposely designed to ensure ease of use and a safe and secure operation for the off-loading of IBC tanks. Fits a 2” ibc coarse thread container. IBC container holds 1000L this item is used and has been steam cleaned. 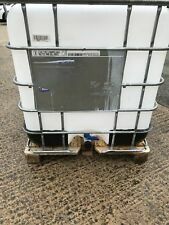 1000 Litre IBC Tank (COLLECTION ONLY). Condition is Used. Collection in person only. 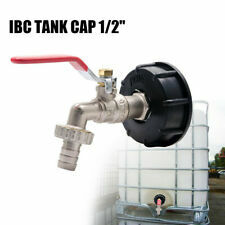 Condition is Used.I have over 50 of these ibc tanks they’ve been used and will need a clean. Ideal for log storage etc single ones £20 buy 10 or more and get them for £10 each. CASH ON COLLECTION ONLY. NOT THE MAIN IBC TAP. THIS IS A TAP TO SCREW ONTO AN IBC TANK. YOU CAN FIT THESE DIRECT ONTO MOST IBC TANKS BYPASSING THE TAP OR DIRECT ONTO THE TAP OUTLET. FITS 99% OF ALL IBC TANKS. ALSO IBC TANKS AND VARIOUS HOSE FITTINGS. S60X6 Thread inlet. 1 x cap with s60x6 thread and 1/2" BSPF adapter. 1 x Lever nickel plated double brass garden tap. snap on connector on second outlet. 3/4" BSPM outlet and snap on hose second outlet. IBC 1000L Tank. Only used with water based product. washed out and ready to go. 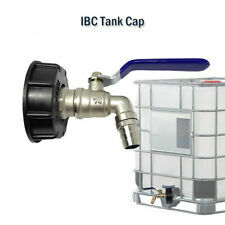 IBC 1000L Tank. Only used with water based product. washed out and ready to go.. Condition is Used. Collection in person only. Used for the transport of non fragranced shower gel, traces of which will remain in the IBC and can be washed out with a hose / jet wash. Size - L 1200 x W 1000 x H1150 Approx. 1 x IBC Tank Adapter. Material: Brass Plastic. Easily remove and install. High quality and eco-friendly material provides a great work performance. 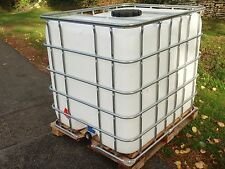 1000 Litre IBC Tank (COLLECTION ONLY). Condition is Used. Camlock connectors for IBC TANK with coarse thread s60x6, hose tail 1" 1.5" 2"
Our IBC adaptors & IBC tank fittings are purposely designed to ensure ease of use and a safe and secure operation for the off-loading of IBC tanks. Ibc to hose pipe 2” coarse thread. View Our Categories. 1000 litre clean Ibc Water Tanks! In good/clean condition Ready to go ! Our IBC adaptors & IBC tank fittings are purposely designed to ensure ease of use and a safe and secure operation for the off-loading of IBC tanks. Ibc hose Adaptor. 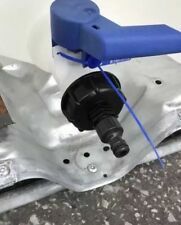 Connect your hose pipe or jet wash into your ibc. YOU ARE BUYING IBC TANKS. WEAR VALLEY TANKS. ROUND SCREW LID AND 61 MM TAP DRAIN OUTLET, STEEL CAGED. 2 people can lift with ease. USED BUT CLEAN READY TO RE-USE. ITEM MUST BE PAID FOR BEFORE LEAVING US. 2x WATER BUTTS ADAPTER CONNECTOR TAP FOR IBC STORAGE TANK + HOSE CONNECTOR 1/2"
WATER BUTTS ADAPTER CONNECTOR TAP FOR IBC STORAGE TANK + HOSE CONNECTOR 1/2"
HOZELOCK 2175 WATER BUTTS ADAPTER CONNECTOR TAP FOR IBC STORAGE TANK D-60mm/ 2"